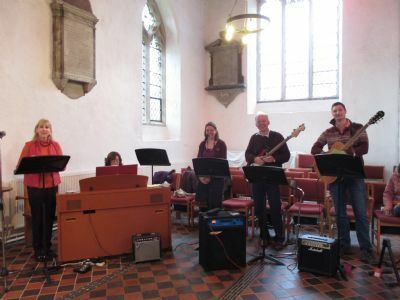 We are an ad hoc group of musicians who get together once a month to provide the music for our Fourth Sunday Service (on the 4th Sunday of each month). At the moment we have a few pianists and singers, 2 flautists, a bass guitarist and a rhythm guitarist, but we could always do with more musicians, so whatever instrument you play, you would be very welcome to join us! We don't all play each month, so different combinations of instruments and voices play and sing together at each service. Music is such a vital part of joyful worship at St Peter's. We enjoy learning and playing a wide variety of worship music, new and old, and enhancing the family services and our encounter with God. Want to join us or see what Music Group is about? Contact Helen Iles: iles.hm@btinternet.com to find out more.